Towing Sacramento's Experts on How to Buy a Good Tow Truck? Home » Sacramento Towing Blog » How to Buy a Good Tow Truck? Getting a truck? Great! But before you sign that check and receive the vehicle there are some important inspections to be made in order to guarantee that you make a good deal and get a quality tow truck. After all, it is not just the driving and hauling we are talking about, it might also be your source of income. Whenever you inspect the condition of a truck, you can’t just look at it from the front but rather check out different angles, like under the hood and underneath the truck itself. Lifting the truck off the ground and up in the air and checking its bottom is extremely important, as the floor of the truck can tell you a lot about it. For instance, you can check and see if there are oil leaks that usually indicate something is wrong with the truck’s mechanics. You can also get a good look at the breaks, the gear, and the steering mechanism. In addition to these elements, it is also crucial to see if there is any rust accumulated on the metal bellow, especially around the pipes and the metal frame. If you can put a hole easily through the metal, then there is no chance you are going to buy that truck. Remember that if the tow truck appears to be shiny and new, it doesn’t necessarily mean that its condition is pristine. A splash of bright new colour can be applied to cover up scratches and rust, so you’d better get a close look to see how things really are beneath that paint. 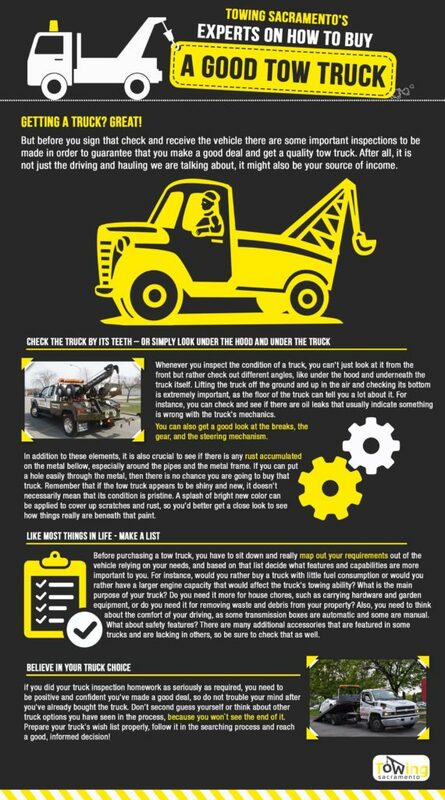 Before purchasing a tow truck, you have to sit down and really map out your requirements out of the vehicle relying on your needs, and based on that list decide what features and capabilities are more important to you. For instance, would you rather buy a truck with little fuel consumption or would you rather have a larger engine capacity that would affect the truck’s towing ability? What is the main purpose of your truck? Do you need it more for house chores, such as carrying hardware and garden equipment, or do you need it for removing waste and debris from your property? Also, you need to think about the comfort of your driving, as some transmission boxes are automatic and some are manual. What about safety features? There are many additional accessories that are featured in some trucks and are lacking in others, so be sure to check that as well. If you had done you truck inspection homework as seriously as required, you need to be positive and confident you’ve made a good deal, so do not trouble your mind after you’ve already bought the truck. Don’t second guess yourself or think about other truck options you have seen in the process because you won`t see the end of it. Prepare your truck’s wish list properly, follow it in the searching process and reach a good, informed decision!